Grace MacInnis was the daughter of J.S. Woodsworth, co-founder of the Cooperative Commonwealth Federation. Married to Angus MacInnis, she has enjoyed an active political career, both provincially and federally. She was party and caucus secretary until 1941. In 1958 MacInnis became provincial president of the CCF. In 1965, after her husband's death, she began a nine-year career as MP for Vancouver-Kingsway. Her interests included the status of women, poverty and housing. 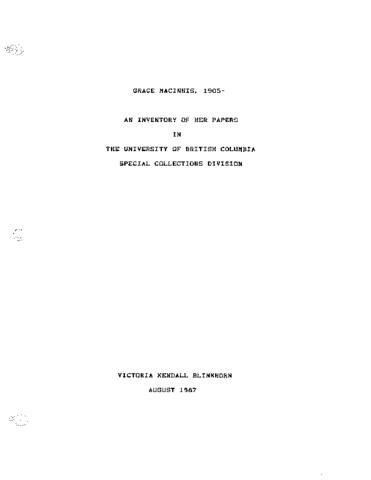 Two biographies,"Grace: The Life of Grace MacInnis" by Sunny P. Lewis and "Grace MacInnis: The Story of Love and Integrity" by Ann Farrell have been written about her. Includes: ca. 1,400 photographs, video tapes, sound cassettes.